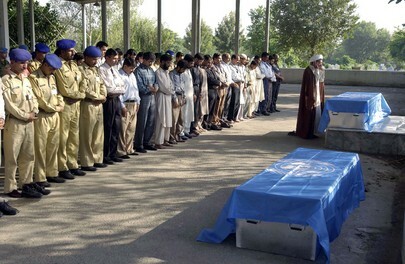 Military staff of the United Nations Military Observer Group in India and Pakistan (UNMOGIP) and other mourners at the burial of Firas Al-Hayali and his seven-year old son, Hussain Al-Hayali, today in Islamabad. The 33-year old Al-Hayali, an IT Network Administrator with UNMOGIP, and his son were killed when the Margala Towers building complex they were in collapsed during the 7.6 magnitude quake that struck northern Pakistan on 8 October. Mr. Al-Hayali was a national of Iraq.